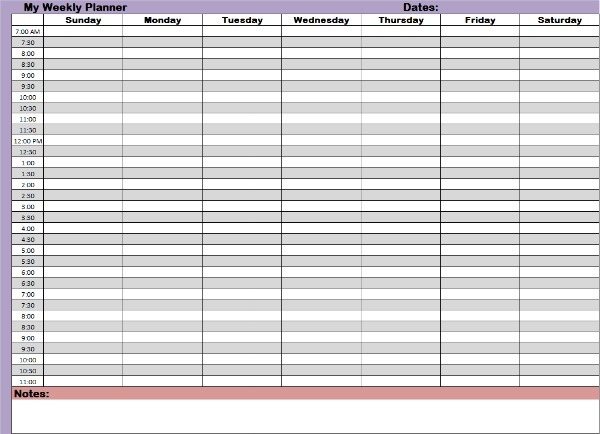 Weekly planners can help you arrange your schedules for each whole week. Planning ahead can make you get organized with the things that you do so you can be prepared early and simplify on doing your activities. Being prepared and aware of the things to come is part of effective leadership characteristics. With week planners you can set up tasks early in expectation of things that are going to happen on each day of the week. With this you can adjust tasks and commitments to its most appropriate time and day which will make things easier as days pass by. Being able to do this you’ll be able to relieve some stress and prevent procrastinating caused by uncertain events and circumstances that cannot be avoided. Printing this weekly planner will need a 8 ½" x 13" piece of paper or "Legal size"
A simple format or structure of a planner does the job! 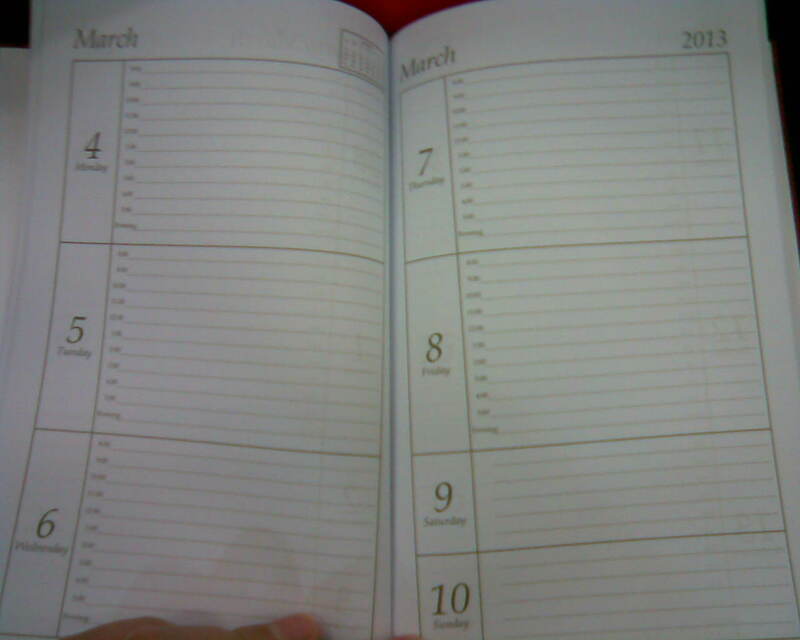 Unlike a daily planner which have clock-times for 1 whole day, weekly planners have clock-times for seven consecutive days that is from Sunday to Saturday. You can plan and fill in your daily schedules in advance if you want and it will be a great timesaver for you if you’ll simplify your thoughts by just following the sequence of tasks you’ve listed. However you must think properly on each day what to write down because you definitely don’t want to mess schedules on your planners if you make mistakes with writing tasks that you didn’t give much thought about. And you cannot be a perfectionist with your plans because things like emergencies and unexpected circumstances may happen so you need to give some allowance as you try to get organized with your time. It’s a good idea to write important things ahead of time which you don’t want to forget or what you might forget because of busyness in life. Deadlines for the week before weekends, what do you need to finish this week? You could consider time for recreation and relaxation. You may be planning to have an outing during the weekends already. If you can arrange and lay down your schedules well on weekly planners for all seven days and follow most of it you’ll see how much you can accomplish. You’ll see that you’re going to save great amounts of time while being able to complete everything you have to do including your personal tasks like your hobbies. If you set your tasks and activities well during the day you can avoid sleep deprivation at night. Sufficient sleep is important for getting things done because you have to be in the right condition to perform well and have good productivity. It would be easier to have work-life balance if you get organized with how you use your time. Priorities combined with sufficient focus and perseverance you can make it possible to follow weekly planners. 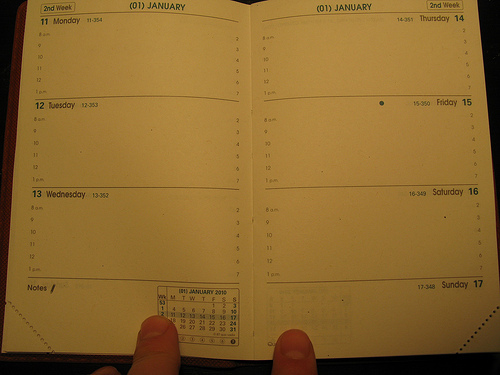 Arrange and assign your tasks well at the best time of a day in your planner. Unlike with daily planners which you would focus on the whole time period on each single day, in weekly planners you would be thinking for multiple days each week. This can be your opportunity to prepare and fix everything so it would be more convenient for you. While planning to accomplish your activities for the week you should also be aware of your working capacity and health. You can then balance your time, efforts, responsibilities and commitments to other people. There may be times when you have to avoid or refuse a request being asked of you and postpone to another date if it seems you’re going to have too much things to do during the week. Work-life balance is also important. You can add other tasks for other people if you have spare time or maybe next week when you’re more free. Why not? Getting things done and completion of your tasks during the week is what’s most important and this can help you avoid problems with anxiety caused by not being able to fulfill things that are important and should’ve been done. Prefer simple living over a complicated one. You don’t actually need all those things desired by most people it will only give you more pressure and stress and even you acquire so much stuff in life it doesn’t guarantee happiness. Organize your things and surroundings. It can relieve you much when things are in order and it will make it easier for you to manage your things and place using good organizing ideas. Think how you can make things easier for you like how you begin your daily routine. Another example is learning to prepare easy recipes that are also healthy for you which can save you lots of time. Do things in advance when you have the motivation, energy and means to do it so you won’t have to think and worry about it another day. Doing things early if you can, is one of the timesavers you can use to help you have work life balance. Anything you can think of that you need to write down such as details, changes, memos, etc. You may prefer this kind if you want to keep records of past weeks’ schedules and tasks. You can buy an organizer like this from bookstores and office equipment shops. While week planners cover each 7 days week time another useful tool you can use for a work-life balance is a monthly planner which acts like a recording calendar. There is a printable planner you can download for any type you need to use. Using week planners can help you get organized and simplify your thoughts about your tasks every week. It can make life easier and help avoid the guilt of not having performed any responsibility at work, at school, with family, friends and other people.